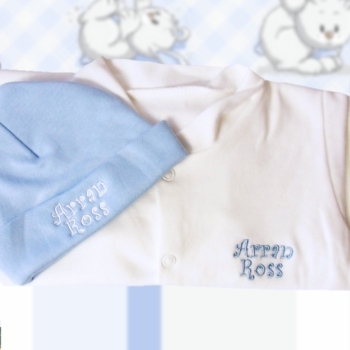 Blue and white baby hat and sleepsuit gift set with a name of your choice. Made in the UK from soft jersey cotton with nickel free popper fastenings down the front of the sleepsuit. Hat and suit are available in sizes from newborn to 12 months. Super soft white sleepsuit with embroidered name in blue thread to compliment the blue hat which is embroidered in white thread. A cute coordinated gift set for babies.